The sunken jetty off of Fossil Point in Coos Bay is a good place to go hunt for crabs or go spearfishing. Access is a little tricky here. While it looks like you could shore dive this site, we haven’t found anywhere with public access nearby to get into the water. Instead, you need to use a boat to access the Fossil Point sunken jetty. Current can really move along at this site from all of the water draining out of the bay so be prepared. 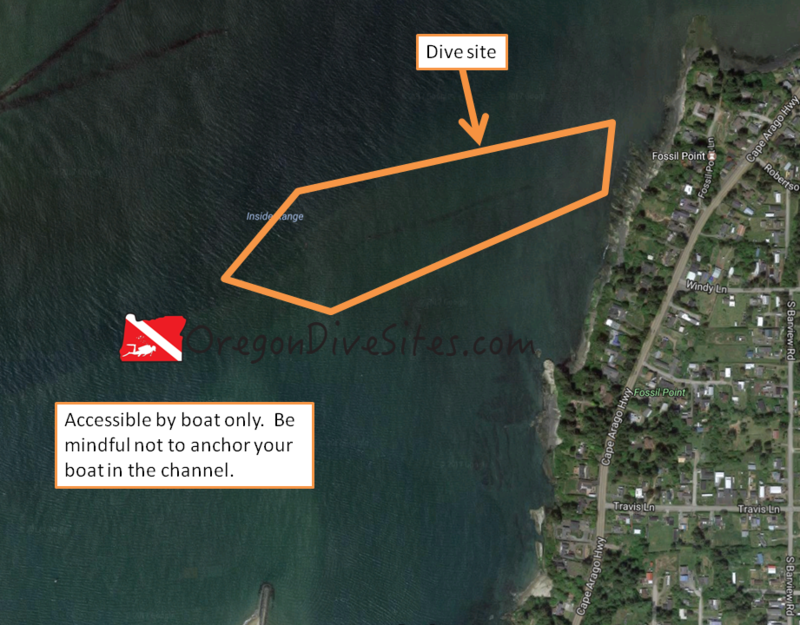 When you anchor your boat before your dive, be sure to do it out of the channel. This is an active shipping area for the various industries in Coos Bay and a small fishing fleet regularly comes through. The jetty itself is rather small but it’s there underwater. This is not a big site by any means but very few people dive here so you will have plenty of opportunities to go hunt crabs or spearfish. Imagery ©2017 Google, Map data ©2017 Google. The Fossil Point sunken jetty is a good place to hunt for crabs and spearfish. We haven’t found any reasonable shore access here so plan to access the site using a boat. The little towns of Barview and Charleston are very close to the Fossil Point sunken jetty. Just up the road/bay are Empire, North Bend, and Coos Bay. The only access to this site is via boat. Charleston has a good place to put boats in. Otherwise, there are many other boat launches in the area. See above. This site is only accessible via boat. The Fossil Point sunken jetty runs more or less east-west with a little bit of a southerly bend. As you go farther west, you’ll find somewhat deeper water. This is a boat dive so be ready to do your proper boat entries and exits. There usually is a current around here. It can really rip if you don’t dive at high tide. Rarely surf, surge, and waves can make their way in from the ocean. Usually though it’s fairly calm aside from the current. Viz is usually around 15 feet although it can get worse during storms or when there is a lot of water pumping through Coos Bay. Water temp is usually in the 45-55F range here. You can go diving on the Fossil Point sunken jetty any time of the year although you should line up your dive with crabbing season if you’re crabbing. At the shallowest point, you’ll find only 10-15 feet of water at high tide. However, at the deepest point you can find up to 45 feet of water where the jetty ends and the shipping channel begins. Open water divers with a few boat dives under their belts can dive this site. The two tricky things are entering/exiting from a boat and the current. We rate this as an intermediate dive. No walk since you’re diving from a boat. No surface swim unless you surface far away from your boat. Be sure your navigation skills are up to snuff! Please be mindful of anchoring anywhere close to the shipping channel. Big ocean-going freighters routinely come in and out of the bay. There used to be a shop in Coos Bay but it appears to have closed. The next closest places for air fills are down in Port Orford at the harbor or up in Depoe Bay (if it’s still open). Otherwise you need to go inland to Grants Pass or Eugene for air and a full service SCUBA shop. There is pretty good food all around the bay. Check out the Fishermen’s Wharf Seafood Market on the dock in Charleston for some really fresh seafood. We haven’t stayed in Coos Bay overnight so please let us know of your hotel and campground recommendations!